In this Rainy Window the rain really falls, well paper rain that is. This is a fun craft for spring time or when learning about the weather! 3. Use a hole punch to make lots of little blue circles. Put 1½ tablespoons of blue circles into your baggie. Seal the bag, but make sure you don't squeeze out all of the air or the rain won't fall right. Test the rain, you can add more or less air to your bag if you need to (more air makes the rain fall faster, less air makes it fall slower). 4. Get all the blue circles into the center of the bag. Sandwich the baggie between the two papers by spreading glue along the edges of the baggie, front and back. Also spread glue on the outer edges of the paper window. 5. 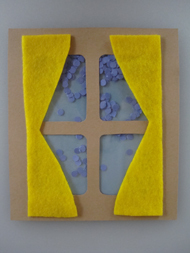 Trace around the curtain template onto a piece of felt or paper and glue in place on your Rainy Window. Once all the glue is dry you can turn and shake your window to make the rain fall!